A regular in the pop up scene, HotBox has held residencies at Street Feast in Dalston, Hawker House and Battersea Power Station; however, on the 4th of December it opened it’s doors to its first permanent site at 46-48 Commercial St.
After a hard day’s work on Thursday, Hannah and I could have been likened to William Wallace in Braveheart. Having made our bid for freedom, the night didn’t exactly get off to a good start; as we crossed the road outside Liverpool street, I was hit by a bike. As I scrambled to get my phone, some hunk from Dirty Martini scooped me up and bandaged up my leg. I didn’t think it was the time and place to offer him my number, but I’m thinking a thank you card might be appropriate. It didn’t take long to get patched up and we soon arrived at Hotbox, an effortlessly cool new meaty restaurant with red lights, straight lines and dark furniture. The staff were lovely and greeted us on arrival with prosecco, then duly topped us up with cocktails and wine. The vodka cocktail was strong and served in a short glass; exactly what I fancied after a manic week! This was followed by a gin, strawberry liquor and soda water cocktail. This was dangerous because it didn’t only look novel, with candy cane style straws and crushed ice, but it also tasted great. The evening was very focused on people socialising whilst enjoying a few delicious bites to give us an insight into the kind of food that would be served. You can expect to see a lot of meat on the menu. 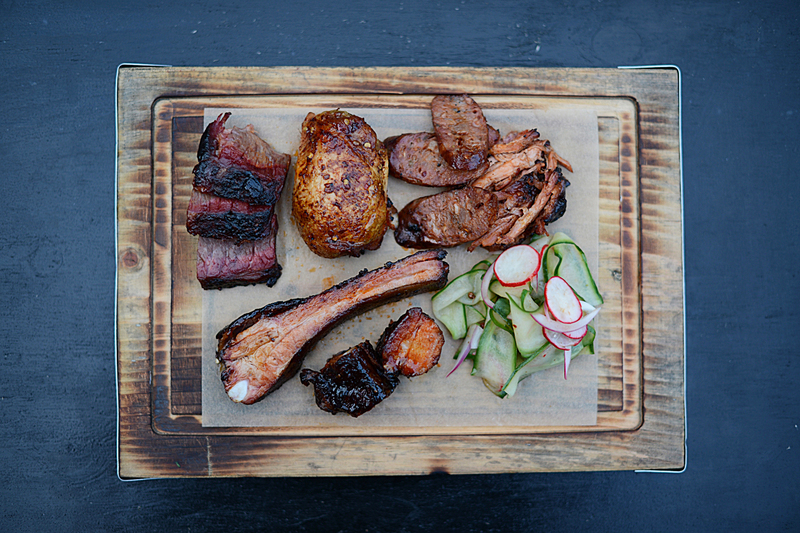 Head chef Lewis Spencer has created a menu with influences beyond the Deep South and you’ll find dishes such as ribs, jalapeno hot link sausage sandwiches, deep fried macaroni balls with jalapeño sauce and wagyu beef brisket rolls. You can’t ask for much more when you are peckish after a few cocktails! There is also a cool downstairs bar – ’46 & Mercy’ which will be serving a number of innovative cocktails, such as Rye Blessed Thistle (Vodka, Pork-Fat and thyme washed aromatised wine and lemon). The music is a massive focus at Hotbox, and the combination of this and the extensive drinks menu makes it a no brainer of a choice to come to kick of a great evening, whether it is during the week or on the weekend! There were no prices around on the night I visited, however I can confidently say £25 a head for food and drinks should cover it.